Foliage somewhat pubescent with soft, white hairs, especially when young, upper leaf surfaces smooth. Leaves ascending from slender root-stocks. Leaf blades at flowering time orbicular or reniform, two-thirds to 2 inches wide, abruptly short pointed at the apex, cordate at the base; summer leaves with large, somewhat roughened blades, broadly ovate, cordate with an open sinus, acute, 2 to 4 inches wide or larger. Flowers white, on stalks as long as the leaves at flowering time, the lateral petals bearded, the upper pair obovate; seeds brown. In summer the plants produce numerous filiform runners. Mountainous and low, moist woodlands, Newfoundland to Dakota and south to Tennessee. The Kidney-leaved White Violet (Viola renifolia A. Gray) is densely pubescent throughout, with reniform leaf blades which are distantly crenate-serrate on the margins and rounded at the apex; petals white, all beardless, the three lower with brownish veins. In Arbor Vitae swamps and cold woods, Newfoundland to Mackenzie river, south to Pennsylvania and Minnesota and along the Rocky mountains to Colorado. 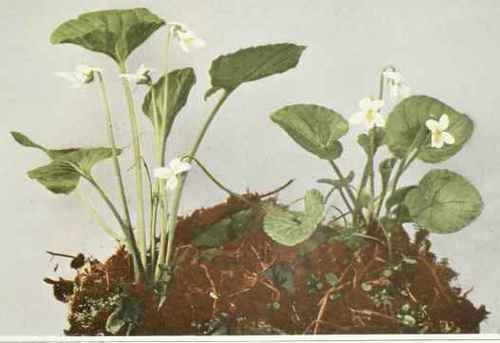 The Sweet White Violet (Viola blanda Willdenow) has the petioles and scapes smooth and often tinged with red; smaller leaves, longer flowering stalks with very fragrant white flowers; lateral petals beardless, the upper pair of petals often long, narrow and strongly reflexed or sometimes twisted; seeds dark brown and minutely roughened. The Northern White Violet (Viola pallens (Banks) Brainerd) has small, broadly ovate or orbicular, smooth, pale-green leaves; scapes much longer than the leaves, bearing white, slightly fragrant flowers. Common in mossy bogs and wet meadows.